You can either print out the quiz or simply write your answers on a piece of paper. The answers are at the bottom of this page (don't cheat and look at the answers first). 1. Jia Jiang believes his life was changed by a box of donuts. 2. What is a donut? a. A type of nut. b. A small fried cake made of sweetened dough. It is usually made in the shape of a ball or ring. 4. Jia said he was “crushed” when an investor rejected his business. What does “crushed” mean? c. He didn’t have any more money. d. He was completely defeated. a. A type of psychoanalysis. b. A software program created by Bill Gates. c. A game created by a Canadian man named Jason Comely. d. The technique of avoiding rejection. a. 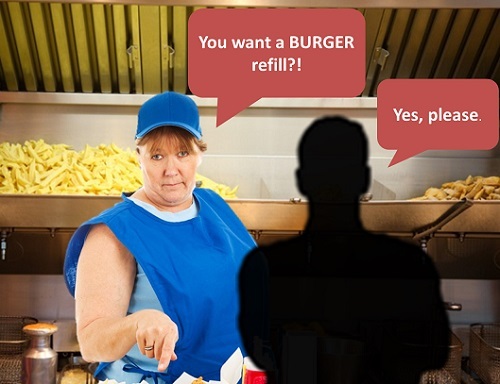 He asked for a burger refill instead of a drink refill. b. 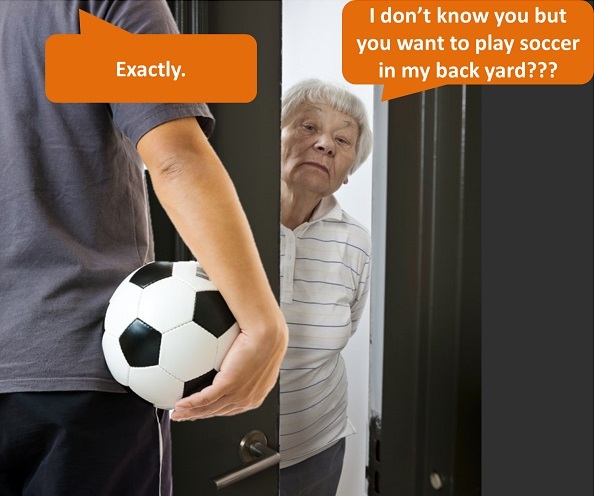 He went to someone’s house he didn’t know and asked if he could play soccer in their back yard. 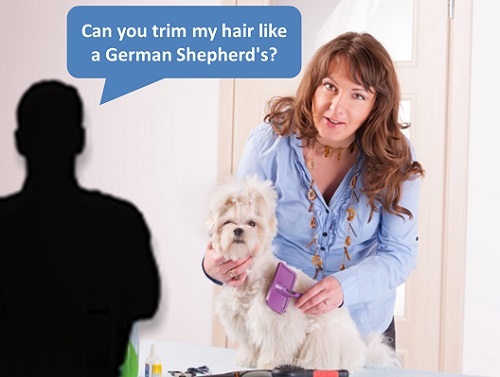 c. He asked a pet groomer to trim his hair like a German Shepherd dog’s hair. 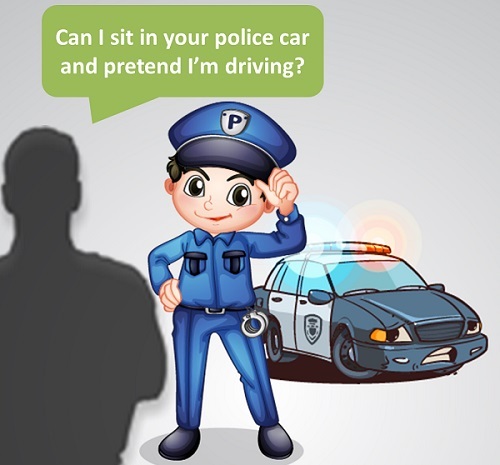 d. He asked a police officer if he could sit in his car and pretend to drive it. 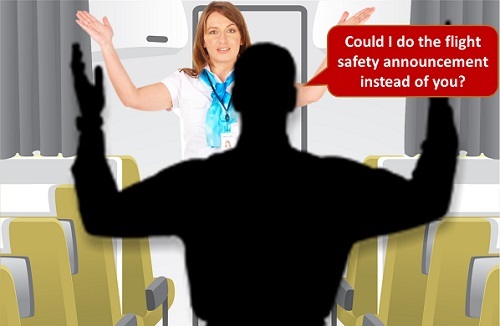 e. He asked to do the safety announcement on the airplane. 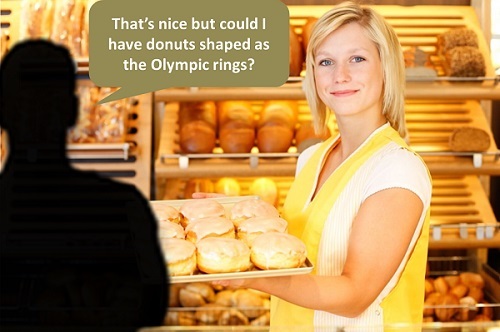 f. He asked for donuts in the shape of the Olympic rings. 7. Jackie, the Krispy Kreme employee told Jia that the donuts were “on her.” What does that mean? a. He didn’t have to pay for the donuts (she would pay for them). b. She never made this kind of donuts before. c. Some of the donut powder spilled on her clothes. d. She was happy to make the specialized donuts. 8. Jia Jiang learned some lessons from his Rejection Therapy. Which one of these lessons does he say is true? a. Rejection is always going to happen some time in your life. b. Rejection will not happen as much when you get older. A donut is a small fried cake of sweetened dough, typically in the shape of a ball or ring.A donut can also be spelled doughnut. Crushed means that someone (or something) is completely defeated. To crush something is to press it so hard that it is made flat or broken into pieces. So he felt like all of his hopes and dreams were broken into pieces. Rejection Therapy is a game that was created by Jason Comely (who is from Canada) to help people build confidence and overcome the fear of rejection. The game has one rule. You must be rejected by a human being at least once every day (preferably 30 days in a row). You must actually be rejected and not just try to be rejected. If you are not rejected by a request, you did not ask enough. He tried to ask for crazy things in order to get a rejection but amazingly these people actually agreed to his request and did not reject him. The donuts were “on her” means that she would pay for them and he didn’t have to pay for them. It’s usually a kind thing to do for someone. For example: At Happy Hour the director said the drinks were on him so we ordered champagne! Jia says that rejection is a fact of life so there will always be a chance it will happen. And, the higher you go in life, the more you will get rejected. For example, President Obama was rejected by 61 million voters in the 2012 election (but the lesson is that he still won!). How did you do on the quiz? Click here to return to Jia Jiang's TED Talk lesson.